Happy Wednesday friends! With the Cyber Sales behind us, I am I am looking forward to sharing some holiday content with you soon! Stay tuned for gift guides and holiday outfits coming your way! If you have anything specific you would like to see, please leave your suggestions in the comments! Always looking for new ideas! I took these photos awhile back and have been meaning to share them! This has been one of my most worn outfits lately! 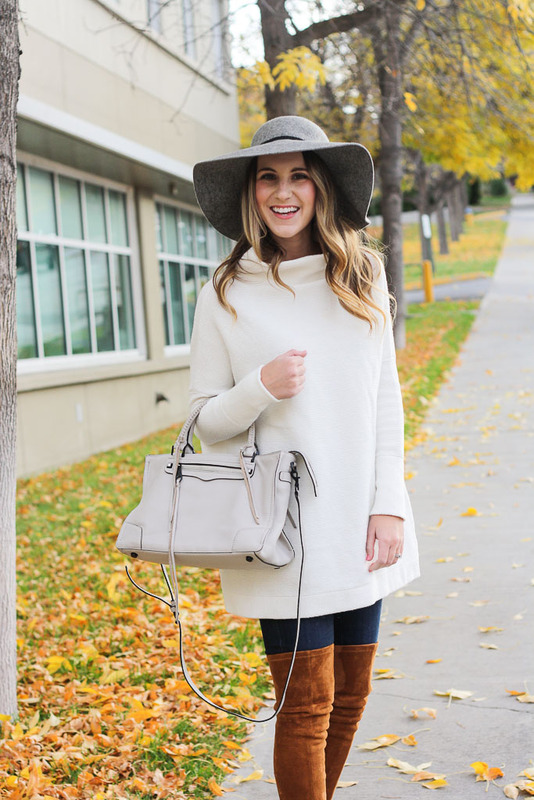 I snagged this $20 oversized sweater in two colors early this fall and have been obsessed! It’s the perfect slouchy sweater to pair with bralettes and denim and it’s so cozy! Keeping it short and sweet today! Cheers to a great Wednesday, friends! 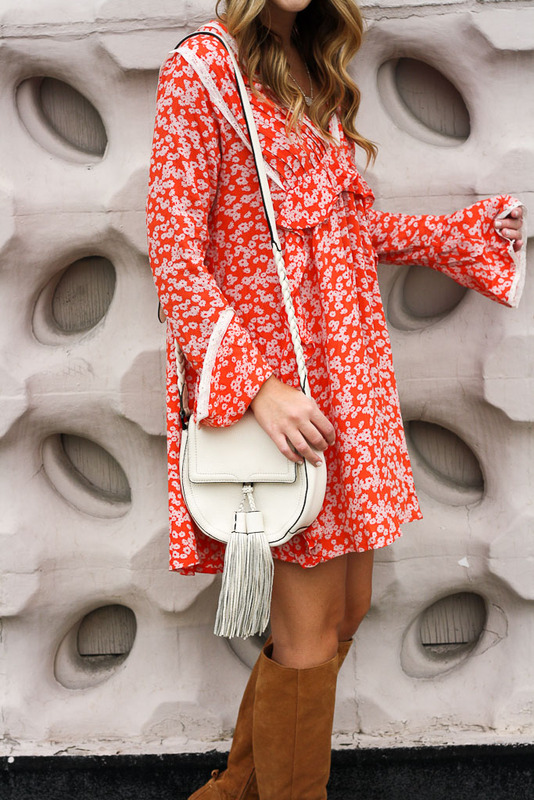 The moment I saw this orange floral ruffle mini dress, I knew it was perfect for fall! I love the vibrant color and the small floral print, but what sold me was the ruffle detailing! Who doesn’t love a good ruffle?! I also love that it has long sleeves, essential for the cooler fall temps! 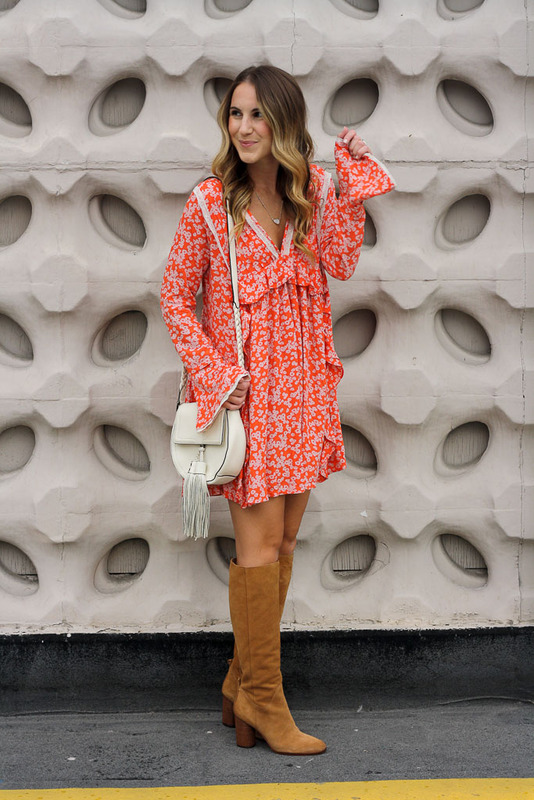 I plan on wearing this orange floral ruffle mini dress to work sometime this week for Halloween! This sweet mini is the perfect way to get in to the festive spirit without going over the top! Now, I have to share my obsession with these boots! If you’ve been looking for a great pair of boots to invest in this fall, these are the ones for you! I have been wearing these non-stop from work to the weekends. Despite having a heel, these are extremely comfortable and easy to walk in. They come in 3 colors (black, dark grey and caramel) but I was drawn to the “golden caramel” finding it the perfect shade for fall. They go with just about everything and I love the suede. They don’t go over the knee, but just below which is a great height, especially if you aren’t a fan of OTK boots or it’s a trend you are nervous to try! I love wearing them with skinny jeans and black pants, but especially love pairing them with dresses (as seen here and here). October 31st is storybook character day at school and I’m still not too sure who to be! I need an easy costume to pull together that my first graders will know. I’m thinking Junie B. Jones is an easy option but would love any suggestions!! Leave me some ideas below! Cheers to a great week babes! 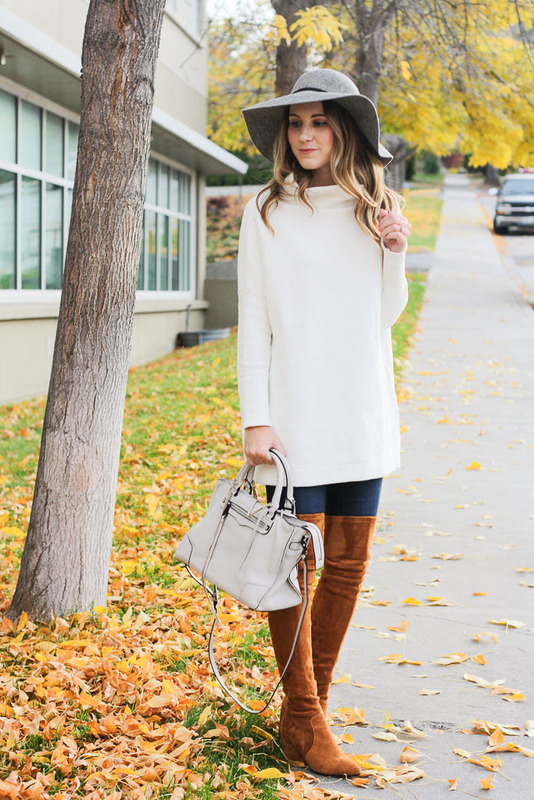 Over the knee boots are one of my must have fall essentials! A great pair of OTK boots can make a basic sweater and jeans combo look instantly more chic. From pairing them with denim and a sweater to a dress, OTK boots are my go to shoe choice in the fall and winter! See how I styled them earlier this year here. I’ve tried multiple pairs of OTK boots and have yet to find the perfect pair that don’t break the bank, until recently! The options I have tried all had great price tags, but I was let down by the quality. Either they sagged (the absolute WORST), were uncomfortable or felt/looked cheap. The moment I discovered these over the knee boots, I knew I had found the PERFECT pair! The quality of these boots is amazing, they definitely feel and look more luxe than their price tag would suggest! They are comfortable, have just the right heel height and most importantly, they stay up! They are truly the ultimate over the knee boots!! I now own them in 2 colors and am eyeing the black, because they are just that good! I paired my cognac boots with a great pair of dark wash denim and an oversized tunic sweater. This outfit could easily be worn to work (swap out the denim for black jeans if needed) or for date night! Accessorize with a floppy hat and top with a plaid scarf for all the fall feels! If you have been looking for the perfect over the knee boots, I highly recommend this pair! They come in black, grey and cognac and are under $150! Shop this look (and my favorite OTK boots) below! Twenties Girl Style2. 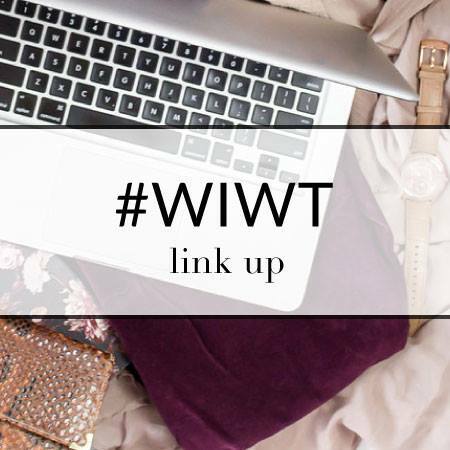 Link back to our site from your post!